You’ve probably seen the passport books for sale in National Park bookstores across the country. You may have flipped through one and thought “that’s nice” and then walked away. That’s too bad. Because you missed the chance to let a new, all consuming obsession take hold of you as you travel across this great land. You’re thinking “Stamps? Really? Are you 86-years-old?” Nope, I just freaking love the challenge. And you should, too. 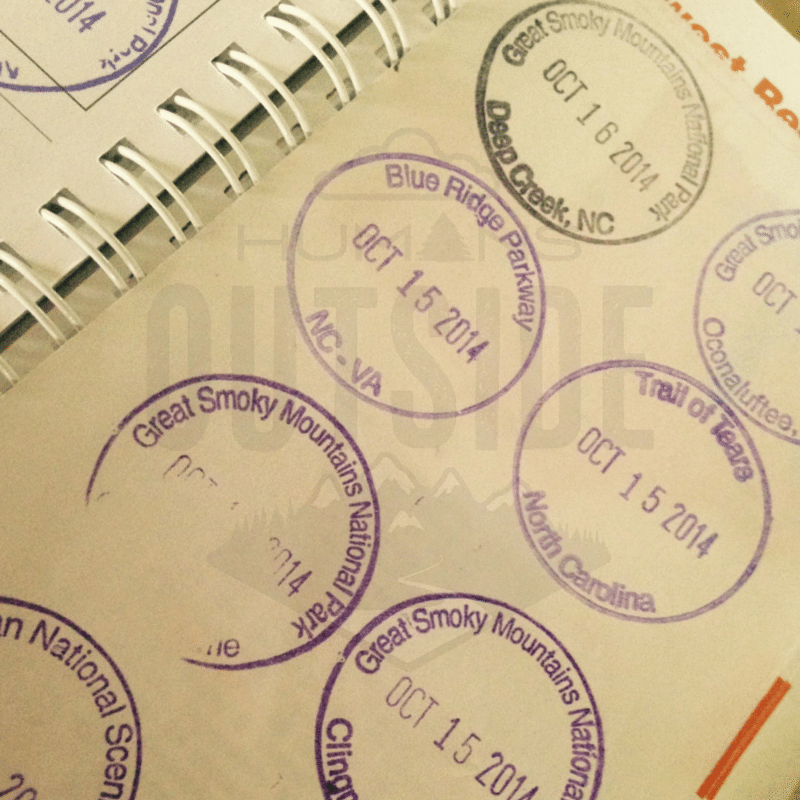 Why do I love collecting the National Park Passport Stamps? First of all, it offers a challenge. Can I get them all? Can I see everything there is to see in every park and “earn” that stamp? Next, it offers a little purpose boost and motivation to our visits to stamp locations. We visit parts of parks that we may not have otherwise stopped at or would have even known existed were not for my stamp chase. 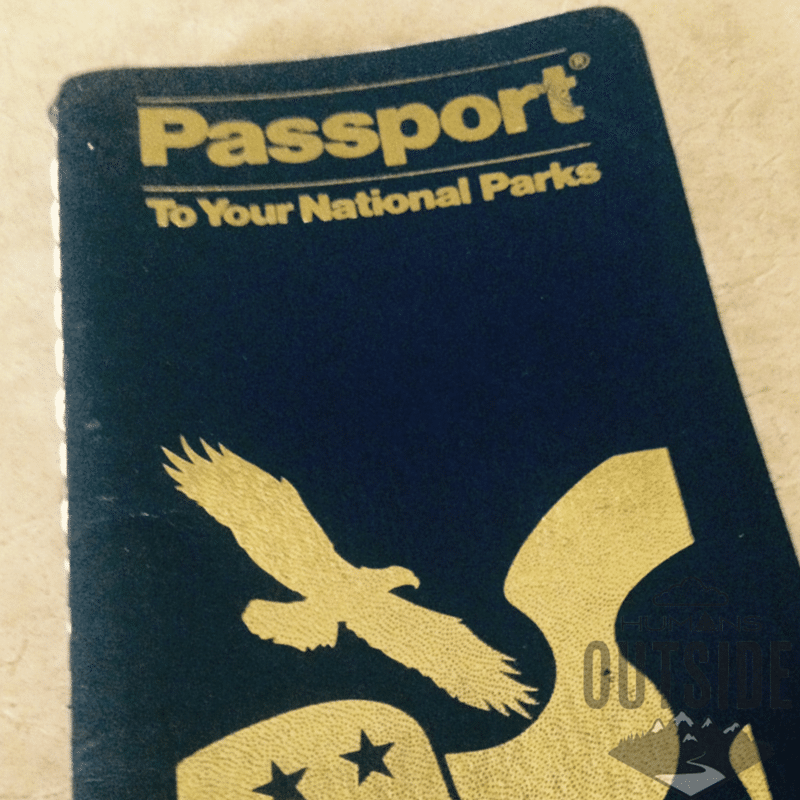 How do you collect National Park passport stamps? It goes like this — first, buy a book at any National Park book store. You can get the kind I have or a larger, more obsessive version is available in the stores. The small version is available for sale online here. When you visit a National Park or affiliate location you can either look for the stamp in the visitor’s center or ask one of the Rangers if they have one. You make sure you’ve got the date right and you stamp the correct section of your book (Southeast, for example). Here’s where it gets fun: many locations have several stamps. 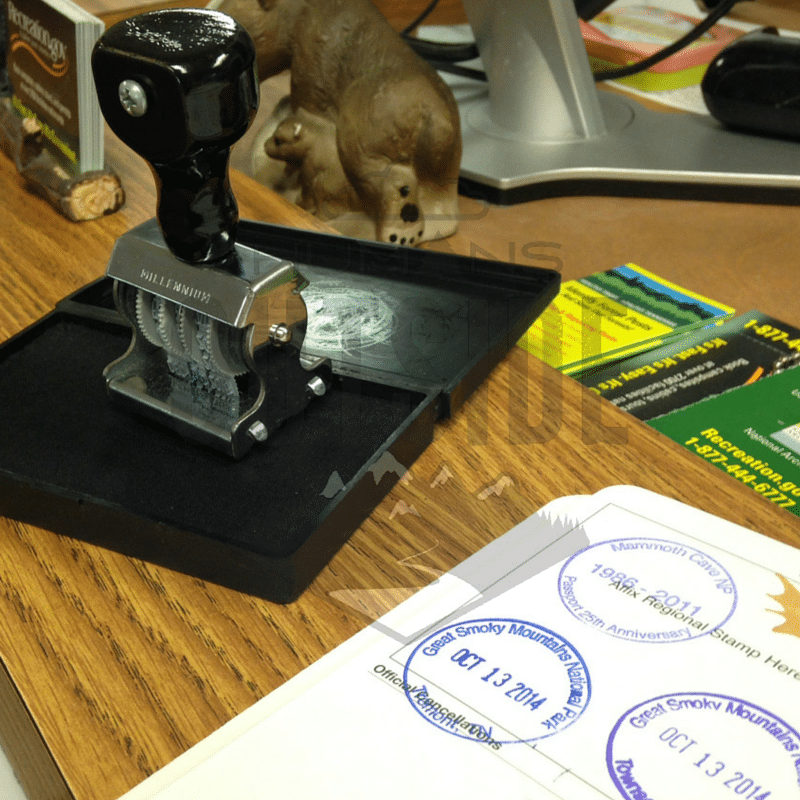 Some locations have “secret” stamps that, for various reasons, are kept behind the counter. Maybe they’ve been retired (for example, the stamp commemorating a certain past anniversary at a location). Maybe they are for a different location that no longer exists (for example, a stamp for Dollywood, Tennessee where the National Park system used to have a station that has since closed). There is a stamp for the Appalachian Trail. There is a stamp for the Natchez Trace. There are stamps for every park and destination you can think of (except the Udvar-Hazy extension for the Smithsonian’s Air and Space Museum — weird if you ask me). There are a few ways you could look at collecting National Park passport stamps. You could have the stamp book, take it with you on your adventures and simply get a stamp every time you come across a stamp station. No sweat. You could have the stamp book, make a point of asking the Ranger at any given location if they have a stamp. Easy. Or. You could have the stamp book, visit places on purpose because you want to collect the stamps AND make sure you have all the stamps you can possibly get. Thrilling. So, how do you find National Park Passport Stamps? Every few months the folks over at Eastern National, the company that produces products for the National Parks update a tremendously long, eye-seering list of stamp locations. The list is thorough, but it doesn’t give any information about where, exactly, stamps are located or whether or not there are “secret” stamps at those locations. And that’s why I recommend my way of finding stamps: join the National Park Travelers Club. For a few dollars a year you can be a member of this club and have access to their master list. This glorious list, which I would totally include a screen shot it it weren’t top secret and for members only, not only contains tips for how to find stamps (“found in the cabinet to the left of the register in a red bag” for example) but it also says when a member last logged seeing it and even gives GPS coordinates for exactly where to find it. Yes, this just got real. The website is a little clunky because it’s older. But don’t let that stop you from using the master list and getting the most out of this fun stamp program. Before we visit a park or take a road trip to, well, anywhere, I do some quick research using the master list to see if any stamps are available where or near where we are going. And then we plan our trip accordingly. I also have personal stamp collecting rules. One of them is that I can’t get the stamp unless I’ve actually experienced the place I’m visiting — no stamping and dashing for me. That means we have the chance to make some quality pit stops on our trips while I “earn” my stamp. And it also means we hit some places we would otherwise just driven by or not known to look for. Have you started collecting stamps? Are you willing to start the obsession? Where can I find stamps from parks that I’ve been to before I started collecting stamps? Even if I have to tape them in. Hi Jeff! This is a tricky one. 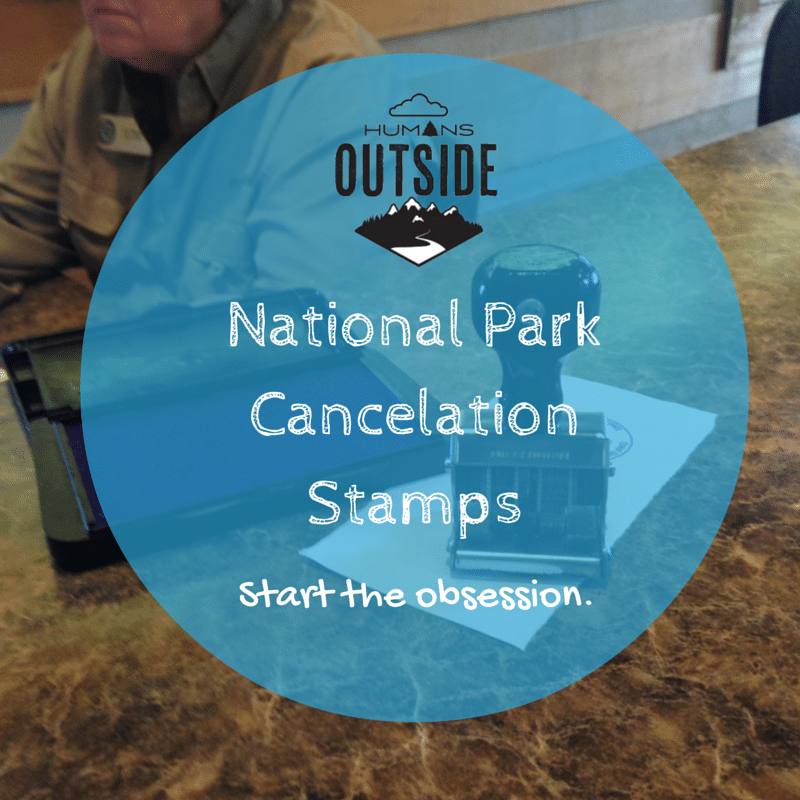 I’ve been told by Rangers at different parks that they regularly get phone calls from people looking to score stamps that they failed to get in the past — and that they will mail them. This rule might depend on the park or the Ranger you are talking to, but it’s worth a shot. Personally? I’ve just decided this calls for a revisit to the parks in question. Good luck! I share in your enthusiasm (I like to call it). I am totally hooked on NP stamp collecting. I have used a system to combine the books that you might appreciate. I used to remove the metal spiral and add pages, but the book got too thick. Instead I took off leather cover, trimmed the middle rib, and connected it with metal rings at top and bottom. Now all stamps are in one book. 🙂 Happy stamping! Hello! I have the same small stamp book you do. There are 400 listed in the book, but I looked online and there are 417 national parks in the US. Do you know where these 17 other loacations are?? It’s killing me. One other thing that you can find as a member of the NPTC is a route planner. Say you’re driving from Chicago to Detroit, and you’re willing to go 10 miles out of your way to get a stamp. Put that info in the route planner, and you will see where all of the stamps are located along your route (plus the 10 miles). I’m at the end of a month-long loop trip from Tennessee to MANY National Parks and other NPS properties. I really wish I had known about the secret stamps before I left. I did ask for a get secret stamps yesterday at Great Sand Dunes (4 stamps) and today at Florissant Fossil Beds ( 1 stamp). One of the rangers told me to send letter to parks I missed and ask for a stamp. She assured me that most rangers are happy to help! Thanks for the info. when I get home next week I have a lot of letters to write! yep obsessed and loving it but I always seem to for get my passport book ???? but this time they had a wonderful solution, I didn’t see it here but might have missed it. it is a small 3 pack of sticky circles, for a buck, easy to keep in your wallet, you can get stamped and then add to your book when you get back to it. love it! Many visitors centers will have squares cut out for those of us that sometimes forget our books. I’m planning on visiting ‘closed’ parks during the government shutdown (since I’ve already purchased my airline ticket). Can I print stamps anywhere as an option?